Old Fashioned Self-Sufficient Living Folding Wall Clothes Drying Rack. 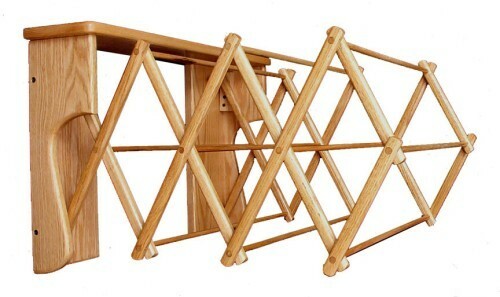 Our Amish 24" folding oak clothes rack, measures 27 x 5.5 x 16. This is a handy out of the way folding rack to have next to the washing machine, in a mud room, or on a covered patio next to the swimming pool. It folds up into a neat oak finished frame and expands quickly for air-drying a multitude of items. Amish handcrafted product. Ships UPS Dimensional weight.